There is an estimated 8 million metric tons of plastic in our world's oceans. The environmental hazards linked to that are far reaching, from damaging marine wildlife to getting into our food sources. It's not a problem that solves itself, so we are lucky to have change-makers among us who are willing to think outside the box to figure out ways to repurpose some of the trash among us. 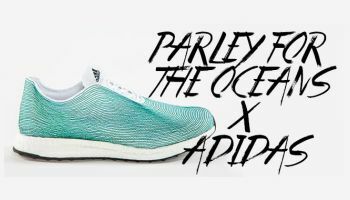 Adidas is one of the latest in the bunch as it partners with Parley for the Oceans (an amazing organization committed to the health and fragility of oceans--and a great place to go to gain information on marine debris and oceanic activism). Adidas has a new shoe on the market that is made from oceanic plastic waste, in particular gill nets (vertical nets that trap fish by their... you guessed it... gills). To learn more about Adidas' new shoes line, watch the videos below or go to Fortress of Solitudes' interview with Adidas & Parley. To learn about their company stance on sustainability, click here.